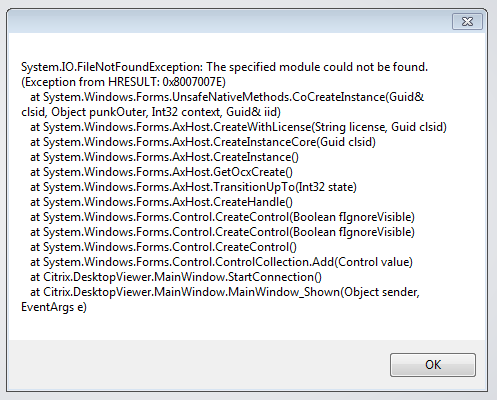 System.IO.FileNotFound Exception error occurs when launching Desktops, but not Published Apps. We have seen this occur when the users don’t reboot in between uninstalling the previous version of Citrix Receiver or running the clean up utility and Installing the new 4.3.X Citrix Receiver. If you get this error, uninstall Citrix Receiver again and reboot. Then download and run Citrix Receiver Clean Up Utility, reboot again and install the latest version of Citrix Receiver.